Astronomers engage in cosmic archaeology. The farther away they look in distance, the further back in time they see, because of the time it takes light to travel from distant stars and galaxies to Earth today. In principle, this allows the entire 13.7 billion year cosmic history of our universe to be reconstructed by surveying the galaxies and other sources of light to large distances. To measure distance, astronomers use the characteristic emission patterns of hydrogen and other chemical elements in the spectrum of each galaxy to measure its cosmological redshift z. As the universe expands, light wavelengths get stretched as well, so that the spectrum we observe today is shifted from the emitted one by a factor of 1+z in wavelength. This then implies that the universe has expanded by a factor of 1+z in linear dimension since that time, and cosmologists can calculate the corresponding distance and cosmic age. Large telescopes have allowed astronomers to observe faint galaxies that are so far away that we see them more than ten billion years in the past. So galaxies were in existence as early as 850 million years after the Big Bang, at a redshift of z ~ 6.5 (Illustration below from Loeb 2006, First Light lecture notes). In addition to galaxies, the other major probe of observational cosmology is the cosmic microwave background (CMB), a radiation relic from the fiery beginning of the universe. The universe cools as it expands, so it was initially far denser and hotter than it is today. For hundreds of thousands of years the cosmic gas consisted of a plasma of protons, electrons, and light nuclei, sustained by the intense thermal motion of these particles. Just like the plasma in our own Sun, the ancient cosmic plasma emitted and scattered a strong field of visible and ultraviolet photons. About 400,000 years after the Big Bang, however, the temperature of the universe dipped for the first time below a few thousand degrees Kelvin. The protons and electrons were now moving slowly enough that they could attract each other and form hydrogen atoms, in a process known as cosmic recombination. With the scattering of the energetic photons now much reduced, the photons continued traveling in straight lines, mostly undisturbed except that cosmic expansion has redshifted them into the microwave regime. The emission temperature of the observed spectrum of these CMB photons is the same in all directions to one part in 100000, which reveals that conditions were extremely uniform in the early universe. It was at the moment of cosmic recombination that gravity entered the scene. Since that time, gravity has amplified the tiny fluctuations in temperature and density observed in the CMB data. Regions that started out slightly denser than average began to contract because the gravitational forces were also slightly stronger than average in these regions. Eventually, after millions of years of contraction, galaxies and the stars within them were able to form. This process, however, would have taken too long to explain the abundance of galaxies today, if it involved only the observed cosmic gas. Instead, gravity is strongly enhanced by the presence of dark matter -- an unknown substance that makes up the vast majority (85%) of the cosmic density of matter. The motion of stars and gas around the centers of nearby galaxies indicates that each is surrounded by an extended mass of dark matter, and so dark matter concentrations are generally referred to as halos. Gravity explains how some gas is pulled into the deep potential wells within dark matter halos and forms the galaxies. On the other hand, cosmologists at first expected the gas outside halos to remain mostly undisturbed. However, observations show that it has not remained neutral (i.e., in atomic form) until the present. To learn about diffuse gas pervading the space outside and between galaxies (referred to as the intergalactic medium, or IGM), astronomers study its absorption against distant quasars, the brightest known astronomical objects. Quasars' great luminosities are believed to be powered by black holes weighing a billion times the mass of the Sun that are situated in the dense centers of massive galaxies. As the surrounding gas falls in toward the black hole, violent collisions within the gas blast radiation into space, creating a beacon visible from afar. The Lyman-alpha (Lyα) resonance line of hydrogen at a wavelength of 1216Å has been widely used to trace hydrogen gas through its absorption of quasar light. The expansion of the universe gives this tool an important advantage common to all spectral absorption probes. Since the wavelength of every photon grows as the universe expands, the rest-frame absorption at 1216Å by a gas element at redshift z is observed today at a wavelength of 1216(1+z)Å. The absorptions of the different gas elements along the line of sight are therefore distributed over a broad range of wavelengths, making it possible to measure the distribution of intergalactic hydrogen. Lyα absorption shows that the IGM has been a hot plasma at least from a cosmic age of 850 million years (z ~ 6.5) until today. Thus, the hydrogen must have been ionized for a second time after it became neutral at cosmic recombination. Radiation from the first generations of stars is a plausible source for the ionizing photons that transformed the IGM by reionizing the hydrogen throughout the universe. Absorption at Lyα is so efficient that it becomes difficult to use as observations approach the reionization epoch where the density of neutral hydrogen is higher than at more recent times. As described below, cosmologists believe that the new technique of ``21-cm cosmology'' will allow them to measure how the reionization process developed over time and to test theoretical predictions of the properties of the first stars. 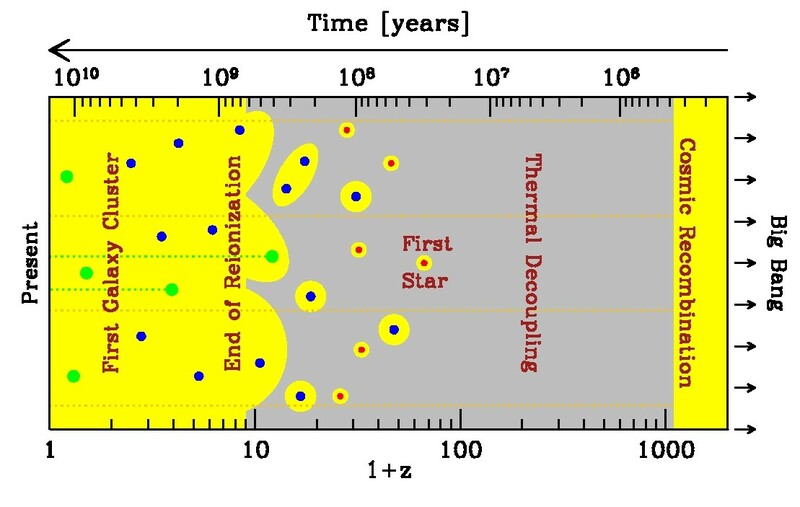 The image below (from Barkana 2006, Science Review) shows an overview of cosmic history, with the age of the universe shown on the top axis and the corresponding redshift on the bottom axis. Yellow represents regions where the hydrogen is ionized, and gray, neutral regions. Stars form in galaxies located within dark matter concentrations whose typical size grows with time, starting with 300 light years (red circles) for the host of the first star, rising to 3000 light years (blue circles) for the sources of reionization, and reaching 600000 light years (green circles) for present-day galaxies like our own Milky Way. Astronomers probe the evolution of the cosmic gas using the absorption of background light (dotted lines) by atomic hydrogen along the line of sight. The classical technique uses absorption by the Ly resonance of hydrogen of the light from bright quasars located within massive galaxies, while a new type of astronomical observation will use the 21-cm line of hydrogen with the CMB as the background source. The most distant galaxies that we can see today were already shining brightly when the universe was just a billion years old. In the ``hierarchical model'' of galaxy formation - in which small galaxies form first and then merge or accrete gas to form larger galaxies - smaller objects should have formed even earlier. So what were the smallest units within which the first stars formed? Stars form when huge amounts of matter collapse to enormous densities. However, the process can be stopped if the pressure exerted by the hot intergalactic gas prevents outlying gas from falling into dark matter concentrations. As the gas falls into a dark matter halo, it forms shocks due to unstable supersonic flow and in the process heats up and can only collapse further by first radiating its energy away. This restricts this process of collapse to very large clumps of dark matter that are around 100,000 times the mass of the Sun. Inside these clumps, the shocked gas loses energy by emitting radiation from excited molecular hydrogen that formed naturally within the primordial gas mixture of hydrogen and helium. Advances in computing power have made possible detailed numerical simulations of how the first stars formed. These simulations begin in the early universe, in which dark matter and gas are distributed uniformly, apart from tiny variations in density and temperature that are statistically distributed according to the patterns observed in the CMB. In order to span the vast range of scales needed to simulate an individual star within a cosmological context, the newest code follows a box a million light years in length and zooms in repeatedly on the densest part of the first collapsing cloud that is found within the simulated volume. The simulation follows gravity, hydrodynamics, and chemical processes in the primordial gas, and resolves a scale 10 orders of magnitudes smaller than that of the simulated box. While the resolved scale is still three orders of magnitudes larger than the size of the Sun, the simulations indicate that the first stars most likely weighed ~100 solar mass each. Although stars were extremely rare at first, gravitational collapse increased the abundance of galactic halos and star formation sites with time. The sources of reionization were most likely a second generation of larger galaxies that formed in halos of mass above ~107 solar mass. The first Milky-Way-sized halo (M = 1012 solar mass) is predicted to have formed 400 million years after the Big Bang, but such halos have become typical galactic hosts only in the last five billion years. Given the understanding described above of how many galaxies formed at various times, the course of reionization can be determined universe-wide by counting photons from all sources of light. Both stars and black holes contribute ionizing photons, but the early universe is dominated by small galaxies which in the local universe have central black holes that are disproportionately small. Thus, stars most likely dominated the production of ionizing photons during the reionization epoch. If the stars within the early galaxies were similar to those observed today, then each star produced ~4000 ionizing photons per baryon, which means that it was sufficient to accumulate a small fraction (of order 0.1%) of the total gas mass in the universe into galaxies in order to ionize the entire IGM. Since most stellar ionizing photons are only slightly more energetic than the 13.6 eV ionization threshold of hydrogen, they are absorbed very quickly once they reach a region with substantial neutral hydrogen. This makes the IGM during reionization a two-phase medium characterized by highly ionized regions separated from neutral regions by sharp ionization fronts. From absorption line work we see that the IGM is completely ionized towards even the most distant objects (quasars) known. There are hints, however, that some large neutral H regions persist at these times so this suggests that we may not need to go to much higher redshifts to begin to see the last stages of reionization. We know that the universe could not have fully reionized earlier than an age of 300 million years, since the freshly created plasma at reionization re-scattered some of the CMB photons and created a clearly-detected polarization signature that constrains the reionization redshift; an earlier reionization, when the universe was still relatively dense, would have created stronger scattering than observed. A detailed picture of reionization as it happens will teach us a great deal, since the spatial distribution of ionized bubbles is determined by clustered groups of galaxies and not by individual galaxies. At such early times galaxies were strongly clustered even on very large scales (10 to 100 million light years), and these scales therefore dominate the structure of reionization. The basic idea is simple. At high redshift, galactic halos are rare and correspond to rare, high density peaks. As an analogy, imagine searching on Earth for mountain peaks above 5000 meters. The 200 such peaks are not at all distributed uniformly but instead are found in a few distinct clusters on top of large mountain ranges. Similarly, in order to find the early galaxies, one must first locate a region with a large-scale density enhancement, and then galaxies will be found there in abundance. The ionizing radiation emitted from the stars in each galaxy initially produces an isolated ionized bubble. However, in a region dense with galaxies the bubbles quickly overlap into one large bubble, completing reionization in this region while the rest of the universe is still mostly neutral. Most importantly, since the abundance of rare density peaks is very sensitive to small changes in the density threshold, even a large-scale region with a small enhanced density (say, 10% above the mean density of the universe) can have a much larger concentration of galaxies than in other regions (e.g., a 50% enhancement). On the other hand, reionization is harder to achieve in dense regions, since the protons and electrons collide and re-form hydrogen atoms more often in such regions, and newly-formed atoms need to be reionized again by additional ionizing photons. However, the overdense regions end up reionizing first since the number of ionizing sources in these regions is increased so strongly (Barkana & Loeb 2004). This expectation for an "inside-out" reionization topology is a key prediction awaiting observational testing. Detailed analytical models that account for large-scale variations in the abundance of galaxies confirm that the typical bubble size starts below a million light years early in reionization, as expected for an individual galaxy, rises to 20 to 30 million light years during the central phase (i.e., when the universe is half ionized), and then by another factor of ~5 towards the end of reionization. These scales are given in ``comoving'' units that scale with the expansion of the universe, so that the actual sizes at a redshift z were smaller than these numbers by a factor of 1+z. Numerical simulations have only recently begun to reach the enormous scales needed to capture this evolution. Accounting precisely for gravitational evolution on a wide range of scales but still crudely for gas dynamics, star formation, and the radiative transfer of ionizing photons, the simulations confirm that the large-scale topology of reionization can be used to study the abundance and clustering of the ionizing sources. The image below (from Barkana 2006, Science Review) shows the spatial structure of cosmic reionization. The illustration (left panel) shows how regions with large-scale overdensities form large concentrations of galaxies (dots) whose ionizing photons produce enormous joint ionized bubbles (upper left). At the same time, galaxies are rare within large-scale voids, in which the IGM is still mostly neutral (lower right). A numerical simulation of reionization (right panel, from Mellema et al. 2007, MNRAS) displays a similar variation in the sizes of ionized bubbles (orange), shown overlayed on the density distribution (green). The image below shows a close-up of cosmic evolution during the epoch of reionization, as revealed in a predicted 21-cm map of the IGM based on a numerical simulation (Mellema et al. 2007, MNRAS). This map is constructed from slices of the simulated cubic box of side 450 million light years (in comoving units), taken at various times during reionization, which for the parameters of this particular simulation spans a period of 250 million years from redshift 15 down to 9.3. The vertical axis shows position χ in units of Mpc/h, which equals ~4.5 million light years. This two-dimensional slice of the sky (one linear direction on the sky versus the line-of-sight or redshift direction) shows log10(Tb), where Tb (in mK) is the 21-cm brightness temperature relative to the CMB. Since neutral regions correspond to strong emission (i.e., a high Tb), this slice illustrates the global progress of reionization and the substantial large-scale spatial fluctuations in reionization history. Observationally it corresponds to a narrow strip half a degree in length on the sky observed with radio telescopes over a wavelength range of 2.2 to 3.4 m (with each wavelength corresponding to 21-cm emission at a specific line-of-sight distance and redshift). The prospect of studying reionization by mapping the distribution of atomic hydrogen across the universe using its prominent 21-cm spectral line has motivated several teams to design and construct arrays of low-frequency radio telescopes; the Primeval Structure Telescope, the Mileura Widefield Array, and the Low Frequency Array will search over the next few years for 21-cm emission or absorption from z~6.5 and above, redshifted and observed today at relatively low frequencies which correspond to wavelengths of 1.5 to 4 meters. The idea is to use the resonance associated with the hyperfine splitting in the ground state of hydrogen. The state with parallel spins of the proton and electron has a slightly higher energy than the state with anti-parallel spins, yielding a spin-flip transition which corresponds to 21-cm wavelength radiation. While the CMB spectrum peaks at a wavelength of 2 mm, it provides a still-measurable intensity at meter wavelengths that can be used as the bright background source against which we can see the expected 1% absorption by neutral hydrogen along the line of sight. Since the CMB covers the entire sky, a complete three-dimensional map of neutral hydrogen can in principle be made from the sky position of each absorbing gas cloud together with its redshift z. Because the smallest angular size resolvable by a telescope is proportional to the observed wavelength, radio astronomy at wavelengths as large as a meter has remained relatively undeveloped. Producing resolved images even of large sources such as cosmological ionized bubbles requires telescopes kilometers in diameter. It is much more cost-effective to use a large array of thousands of simple antennas distributed over several kilometers. The new experiments are being placed mostly in remote sites, because the cosmic wavelength region overlaps with more mundane terrestrial telecommunications. Iν = 2 kB Tb ν2 / c2. In approaching redshifted 21-cm observations, although the first inkling might be to consider the mean emission signal, the signal is 100,000 times weaker than foreground emission from magnetized plasma in our own Milky Way and other nearby galaxies. Thus cosmologists have focused on the expected characteristic variations in Tb, both with position on the sky and especially with frequency, which signifies redshift for the cosmic signal but simply frequency for the foreground, which is expected to have the known smooth spectrum of emission from energetic particles in plasmas. The 21-cm brightness temperature depends on the density of neutral hydrogen. As explained before, large-scale patterns in the reionization are driven by spatial variations in the abundance of galaxies; the 21-cm fluctuations reach ~5 mK (root mean square) in brightness temperature on a scale of 30 million light years (comoving). While detailed maps will be difficult to extract due to the foreground emission, a statistical detection of these fluctuations (through the power spectrum) is expected to be well within the capabilities of the first-generation experiments now being built. The key information on the topology and timing of reionization can be extracted statistically, with an important check made possible by measuring the particular form of anisotropy, expected in the 21-cm fluctuations, that is caused by gas motions along the line of sight. The theoretical expectations presented here for reionization and for the 21-cm signal are based on rather large extrapolations from observed galaxies to deduce the properties of much smaller galaxies that formed at an earlier cosmic epoch. Considerable surprises are thus possible, such as an early population of quasars or even exotic particles that emitted ionizing radiation when they radioactively decayed. In any case, a detection of the cosmological 21-cm signal will open a new window on the universe and likely motivate a second generation of more powerful telescopes. These will be used to obtain three-dimensional maps of atomic hydrogen during reionization as well as statistical power-spectrum measurements at even higher redshifts (using wavelengths at which the foregrounds are brighter and thus more difficult to remove). Since the 21-cm measurements are sensitive to any difference between the hydrogen temperature and the CMB temperature, the potential reach of 21-cm cosmology extends down to a cosmic age of ~6 million years, when the IGM first cooled below the CMB temperature (an event referred to as ``thermal decoupling'') due to the cosmic expansion. The 21-cm technique may open up entirely new cosmological areas, such as investigations of the primordial origin of spatial density variations by measuring them on very small scales which are washed out in the CMB, and the detection and study of the galaxies from early times (200 million years) through the effect of their stellar radiation on the intergalactic hydrogen. Understandably, astronomers are eager to start tuning into the cosmic radio channels of 21-cm cosmology.